During World War II 120,000 ethnic Japanese on the west coast, two-thirds of them American citizens, were forced into a series of camps to live under armed guard. Japanese-American confinement was authorized by President Franklin D. Roosevelt and supported by Congress and the Supreme Court. Authorities feared that Japanese residents were disloyal and might aid in a Japanese invasion of the United States. 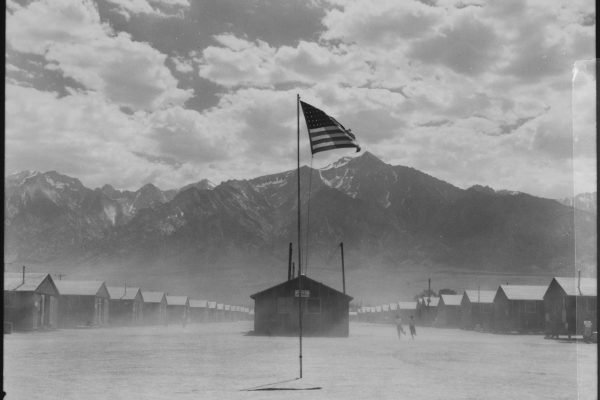 Japanese Americans contested these charges throughout the war and later sought formal redress. In 1983, a bipartisan congressional committee concluded that confinement was based on war hysteria, failure of government and military leadership, and racism against those of Japanese ancestry. “The Tragedy of War” revisits the injustice of Japanese-American confinement by telling their stories and asking a question that resonates today: At what point should the rights of citizens be limited or denied to ensure our nation is secure? Planning on bringing your students? Creating a lesson plan for your classroom? Download these educational guides for this exhibit! This exhibit is on loan from the Museum of History and Holocaust Education at Kennesaw State University.